Heading to Pennsylvania and looking to spend roughly 48 hours in Philadelphia?! 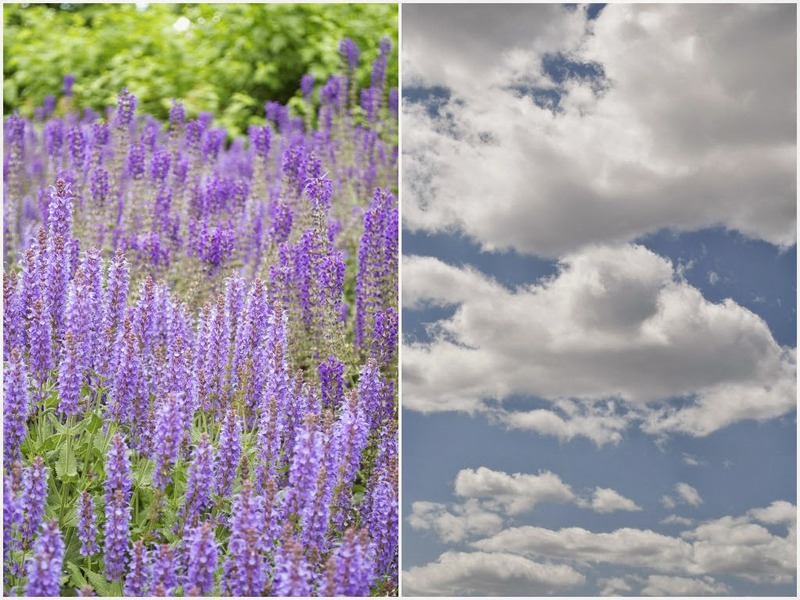 You’re in luck, read on to find out how to spend a wonderful weekend in Philadelphia! Having lived on the East Coast my entire life, can you believe I never made the quick jaunt over to Philly? Not even for 48 hours in Philadelphia! How ridiculous is that?! At just over 2 hours away from New York City, Philadelphia makes the perfect getaway for a long weekend just about any time of year. So when my sister Ali and I were both able to take a day off from work (!!! 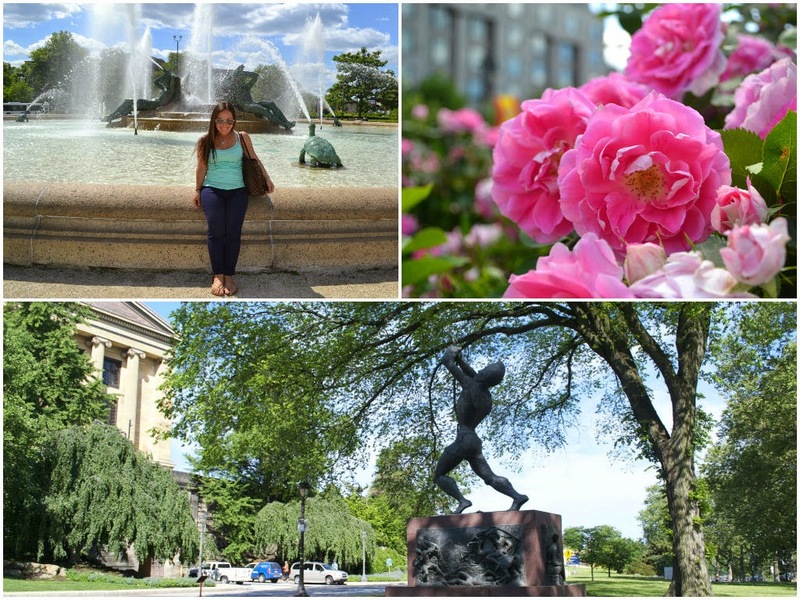 ), we decided that the City of Brotherly Love would be the most perfect place to explore for a few days. With just about 48 hours in Philadelphia to cram in as many attractions (and local treats) as we possibly could, we started each morning early and ended each night late. 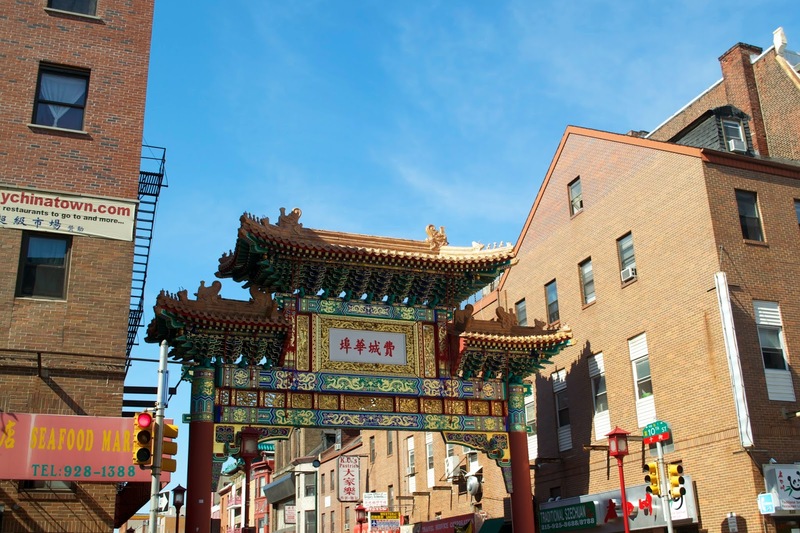 We spent our time gallivanting around the streets (a good mix of cobblestone and paved roads), admiring the murals scattered around the city, shoving our mouths with treats from Reading Terminal Market, all while learning about some of the country’s most significant historic attractions. While researching before our trip, we came across the Kimpton brand, and it’s two properties in Philadelphia – Hotel Palomar and Hotel Monaco. What do you do when you’re staying in a city and cannot decide between two hotels? You stay at both, obviously! While some amenities overlapped, each one had its own distinct style and charm. Both locations were ideal for site seeing, and very convenient to drool-worthy restaurants and parks. No need for a car or even public transportation while staying at each property- now that’s what you call a walkable city! Our bodies definitely thanked us for all the exercise we got after all the indulgences we hadn’t thought twice about. We even had our own leopard-print bathrobe dance party in our hotel room – a surprisingly treat we found in the closet. 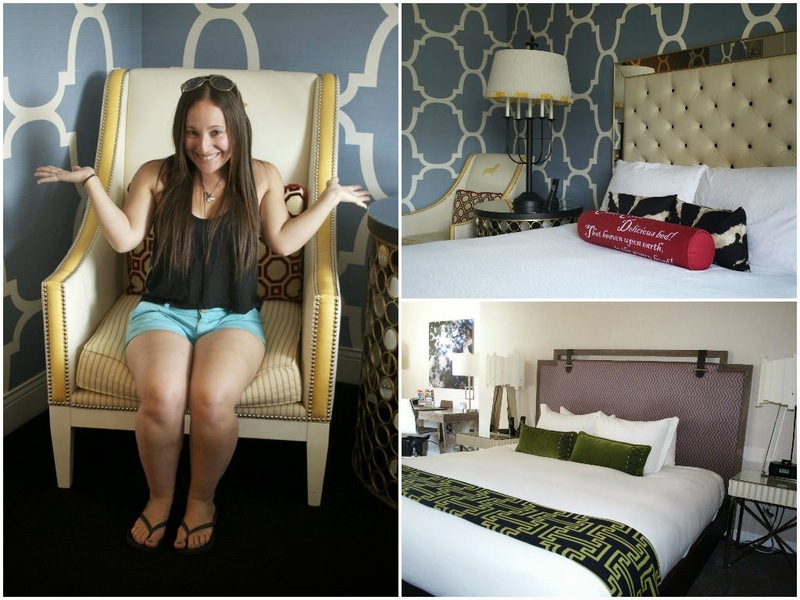 My sister then proclaimed the need to have her future bachelorette party at Hotel Monaco. With complimentary wine hour at both properties, unlimited bellini’s at the Red Owl Tavern (at Hotel Palomar), and funky chandeliers and a chic atmosphere; she’s right, either would make for the most perfect girls getaway! Officially named JFK Plaza, but commonly referred to and nicknamed LOVE Park, this area was no better place to continue our weekend of sisterly bonding. We made sure to snap a few selfies in front of the LOVE sculpture – you can’t miss it, just be courteous to the other tourists and wait in line. We also enjoyed sitting by the single spout fountain, which not only brings some sparkle to the space, but is a great place to bring your pretzel or cookies from Reading Terminal Market and people watch. Even better, we were able to walk to LOVE Park from Hotel Palomar, meaning we could enjoy our bellini’s from brunch without any worry of reckless driving. Freshly manicured lawns, memorial statues placed throughout, and comfy benches for people watching – what a great green space in the heart of Philly! We got lucky and stumbled upon a farmers market, complete with organic produce, fresh flowers, local art, and lots of floppy-eared dogs, which I later learned actually runs year round! After some strolling, we found ourselves hungry again (a recurring theme in Philly) and shared a meal across the street, alfresco style. The square is surrounded by restaurants, shops, and hotels, so naturally, we checked out the latest fashions while digesting. Next time we visit, I’m definitely bringing a good book and relaxing on a bench for a while. Seems like the perfect place to get lost for a while. This self-guided tour can take you all day or only a few hours, depending on how much time you spend at each stop. We opted to move through pretty fast since we had other items on our agenda for the day (including making it back for wine hour at the Palomar à very necessary). The Parkway, as it’s commonly referred to, is a mile-long scenic road in Philadelphia, starting from City Hall, looping around Logan Circle, and ending before the Philadelphia Museum of Art. 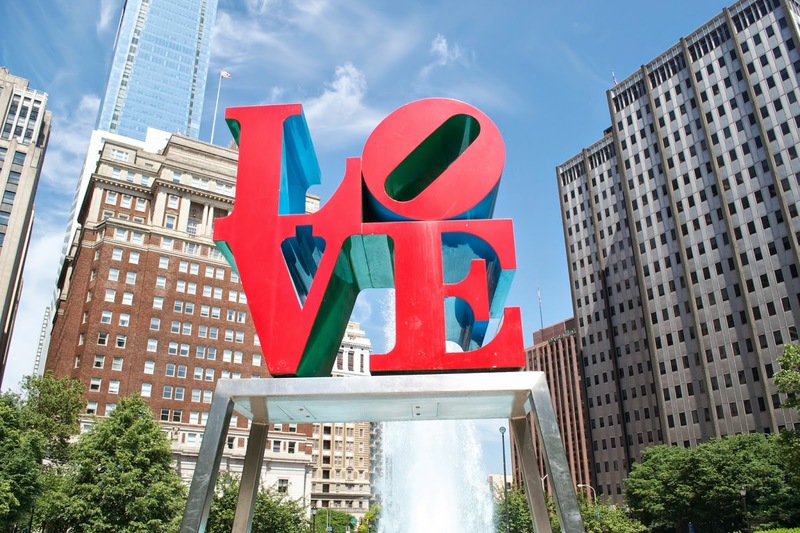 Art sculptures line the boulevard (you just have to know where to find them), and some of the city’s most famous sights are here, including the Free Library of Philadelphia, The Franklin Institute, The Academy of Natural Sciences, and the Rodin Museum. If museums are your thing, there’s plenty to see and do, but if you’d rather go for a leisurely scenic stroll, be sure to walk to Fairmount Park via the northern end of the Parkway. On a bright and sunny day there’s no better place to be than on Kelly Drive or the Schuylkill River Trail. How can you visit Philly, home of the country’s most significant historical attractions, and miss out on the Liberty Bell? Even with only 48 hours in Philadelphia, you can’t. With no admission fees and easy access (being so close to Hotel Monaco and Independence Hall), it would be a shame to skip this symbol of American Independence altogether. Ali and I waited on a rather long line, which thankfully moved pretty fast. You can take your time throughout the exhibit, reading and learning how the Bell influenced American History. If you’re exceptionally tight on time (or the Liberty Bell Center is closed), you can actually view the bell 24/7 from the outside of its glass pavilion. I guarantee you your photos won’t be as good though. Fun Fact: Did you know there have actually been three (!!! ), yes three, Liberty Bells? The first one cracked during a test ringing, and had to be recast twice in 1753. The Bell then cracked again in 1835, which is the bell and crack we view today. This market is no ordinary market. With fresh cut flowers, the best restaurants/venders under one roof, and a farmers market (albeit rather pricy), you’ll want around an hour or so to walk around and take all the energy in. There are an overwhelming amount of options to choose from – hoagies, Thai, Indian, fish, cheesesteaks, pizza, etc etc etc, along with an endless supply of indulgences for dessert. 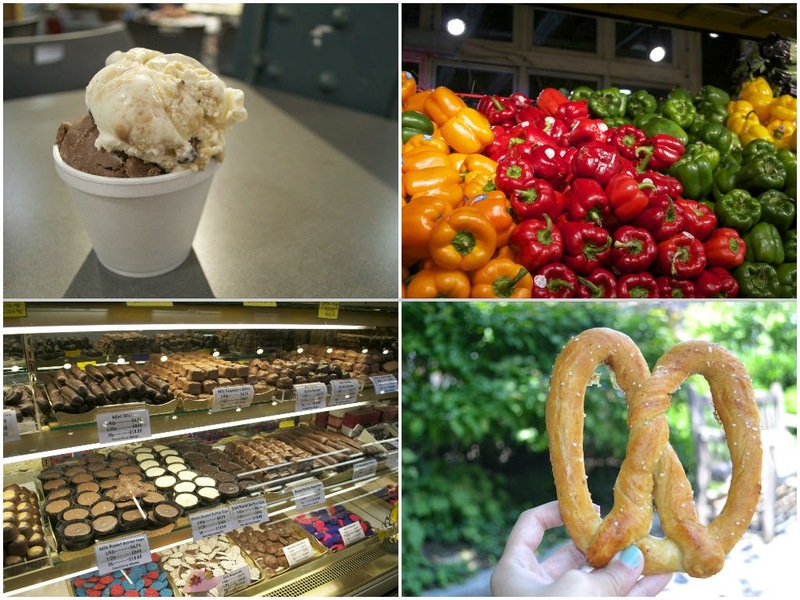 My suggestion – skip lunch and opt for soft pretzels from Millers Twist, homemade cookies from The Famous 4th Street Cookie Company, and ice cream from Bassett’s. Or have a proper meal and choose one (or two!) for dessert! Just make sure you go hungry! This long weekend (well, technically 48 hours in Philadelphia) was definitely not enough time to check off all the attractions and restaurants on our very ambitious list, but it gave us a pleasant sampling and overview of the city. On the bus ride back home to good ol’ NYC, we made a list of Philly to-do’s for our next trip, which will most definitely be sooner than later. This sister weekend in the City of Brotherly Love was the most perfect way for us to bond… over freshly baked cookies and homemade ice cream. No Philly Cheese Steaks during this trip, until next time that is, when I’ll be taste testing two or three.